Daugavpils is a city of a little under a hundred thousand people and is the largest conurbation in Latgale, the easternmost and most idiosyncratic of Latvia’s four provinces. The city straddles the Daugava (the name translates literally as “Daugava Castle”), the country’s longest river and the closest to its heart, often evoked in songs and poetry as a watery stand-in for Latvia itself. The Daugava flows in a sinuous diagonal through Latvia, slicing it pretty neatly into halves, before emerging, much broader, into the Gulf of Riga. Even two hundred kilometres down from the capital, at Daugavpils, it’s wide enough that the bridge takes me a good two or three minutes to walk across. From the middle of the bridge, I turn and look to either side: the city’s unassuming postwar rectangles on one side, and on the other, the sturdy but knocked-about wooden houses of Daugavpils’ riverside suburb of Grīva. Latgale as a whole is finely balanced between ethnic Russians and Latvians (most of whom are speakers of Latgalian), but Daugavpils is de facto a Russian-speaking city, with fewer than one in every five inhabitants identifying as Latvian. Perhaps for this reason, it is relatively rare that it makes even the Latvian news and, until recently, the rest of the world was largely unaware of its existence. Russia’s aggression against Ukraine changed all that, placing, in the eyes of the international media, a giant question mark over the demographically complex region of Latgale, and especially over Daugavpils. An article in The Telegraph at the outbreak of the Ukraine crisis misleadingly described Latgale as “Latvia’s Crimea”, and earlier this year, a high-profile BBC faux-documentary, “Inside the War Room”, war-gamed a confrontation with Putin as a result of pro-Russian riots and separatist activity in Daugavpils. But if we go back to 95 years, to the Daugavpils of the first independent Republic of Latvia that existed between the two world wars, we would find comparable levels of Latvian fear and suspicion about revanchism and manipulation of national minorities. Only that then, in Daugavpils and its surrounding towns at least, it would have been suspicion not of Russia, but of Poland. This sounds strange to Latvians now. For obvious reasons, Poland no longer plays much of a role in Latvia’s conception of its region: since World War II, it’s retreated far away to the south and east, so that it’s now over 200 miles from Daugavpils to the Polish border. 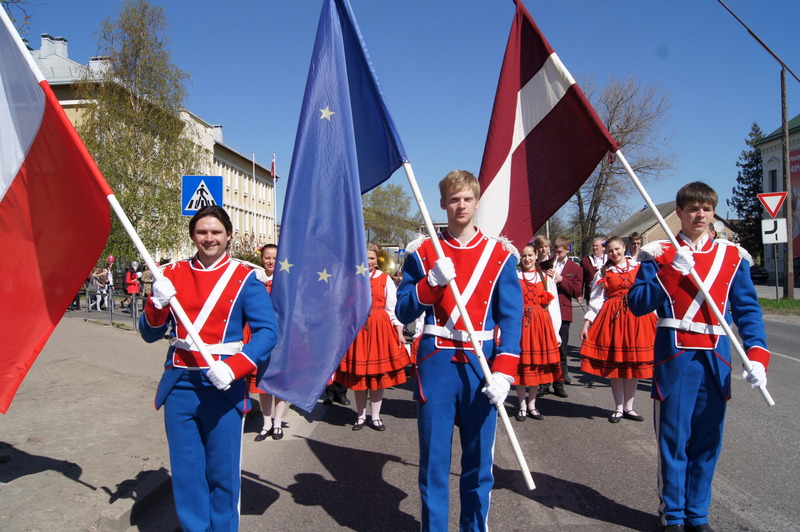 But Polish cultural and political influence, in Latgale at least, has not historically been greatly less than in Lithuania, although the connection with Latvia’s southern neighbour is much better known. Indeed, had just a few events turned out differently, the stretch of the Daugava I walked over could have become the border between Poland and Latvia, making Daugavpils a frontier town, looking across the water at Polish Gryzwa (Grīva). In 2013, an enormously popular play, Latgola.lv, opened at the Latvian National Theatre in Riga – a comedy trading on, mostly affectionate, stereotypes of Latgalians as emotionally unpredictable, close-knit, and extraordinarily fond of drinking and dancing. They are indisputably Latvian, and yet clearly other; as one non-Latgalian Latvian put it to me “they speak funny, they spend their time making pottery, they have wedding celebrations that go on for days”; in a reserved, restrained country like Latvia, this is indeed remarkable. Latgale’s outlandish, Slavic qualities can be put down to a large degree to its highly distinct history. Unlike Riga and Vidzeme (northern Latvia), which were part of the Polish-Lithuanian Commonwealth for a mere forty years from the late 16th century before being taken by Sweden, unbroken Polish rule continued in Latgale (then known as Inflanty) for over 200 years, right up to the partition of Poland in 1772, after which it became part of the Russian Empire. This was long enough to leave imprints that are still immediately detectible. Latvia is traditionally a Lutheran country, but Latgalians are still overwhelmingly Catholic. The variant of Latvian spoken in Latgale also bears strong traces of Polish influence, and is often mutually unintelligible with Latvian, due to differing orthography and frequent vowel shifts that twist and clip the long, round vowel sounds of standard Latvian. Wealthy landowners in Latgale were Polish, rather than in German in the rest of Latvia. Many common people in the region also spoke Polish, although whether they were mostly ethnic Poles or Latgalians who had Polonised themselves for reasons of self-advancement remains contested. However, in the chaotic years after the Russian Revolution and the country’s withdrawal from World War I, Latvia and Poland became natural allies against both Russia and Germany. Polish troops fought and died alongside Latvians in Latgale during the bafflingly complicated struggle for Latvian independence. Poland seemed to be staking no claim to the vast majority of the former Inflanty territory. But just a couple of weeks after united Polish-Latvian forces took Daugavpils in January 1920, effectively defeating the Bolsheviks in Latgale, Latvian border guards crossing the River Daugava on their way to Grīva were stopped by their erstwhile allies, who informed them that the town now belonged to Poland. In view of the large number of ethnic Poles in the area, the Polish government subsequently declared that it viewed Grīva, the nearby, middling-sized town of Ilūkste and six other parishes as Polish territory. For the next six months, an odd, non-violent stand-off ensued; Latvian officials periodically trying to establish border posts and enforce their authority over the region, but being rebuffed by Polish troops. The impasse was resolved in an unexpected way when the Soviet Union launched an invasion of Poland in summer 1920. Troops were pulled back to defend Warsaw, and in response, the Latvians crossed the river and took Grīva and Ilūkste, after a brief non-fatal scuffle with the Lithuanian army, whose country had also made a claim to the disputed area. After defeating the Soviets, Polish forces returned. The government protested Latvia’s actions but took no concrete action. Within the previous year, Poland had fought not only Germany and the Soviet Union, but also Ukrainian, Czechoslovak and Lithuanian armies, and clearly had no appetite for another military confrontation over such a small area of land. Polish representatives brought up the Ilūkste issue at a number of international conferences in the early 1920s, but received little outside interest or sympathy. But a border treaty wasn’t signed until 1929 and it took a further seven years to build a fence. This made the Latvian-Polish border prone to smuggling and illegal incursions. Registered complaints from Latvia in the early 1920s include Polish troops breaking into the house of a farmer on the Latvian side and stealing potatoes, and the destruction of a bridge in Latvian territory for uncertain reasons. The Poles who did find themselves in the state of Latvia became the new country’s fourth-largest minority at 3% of the total population, behind the Russians, Germans and Jews. Despite their relatively small size, the Poles were unusually well-organised and united and thus able to take full advantage of the republic’s fairly liberal laws on national minorities, which guaranteed cultural autonomy. State-funded Polish schools were opened – peaking at as many as 60 – and the political party the Polish-Catholic Latvian Union of Poles was formed to defend the interests of Latvian Poles, winning two seats in the 100-member Saeima (Latvian Parliament) in 1925 and 1928. Uniquely among the minorities, the proportion of representatives and of schools teaching in their native language corresponded almost exactly to their share of the population. The Poles’ situation did deteriorate somewhat after 1934, when Latvian nationalist Kārlis Ulmanis was brought to power in a coup and suspended democracy. Some Polish-language newspapers were closed, including the widely-read Dzwon, and the number of Polish schools began to decline. The National Library of Latvia is holding a donation ceremony to mark a new section of books dedicated to Poland, and as well as the Polish ambassador and embassy staff, the leaders of the Polish community in Riga are present. Some – predominantly younger – are speaking in Latvian, others in Polish, although most seem at least conversant in both languages. But the strained accents of some of the Latvian-speakers are clear when they switch to Polish, and one woman I speak to who runs a Polish organisation in the capital admits that she didn’t grow up speaking the language. All those I speak to are firmly pro-Latvian and consider themselves patriots of both countries. When I ask one Pole present whether Poles in Riga feel more of an affinity with Latvians than with local Russians, even though Latvian is not a Slavic language or culture, I’m answered with a slightly offended “of course”. This state of affairs – the loss of an ability to speak Polish among many; fairly close identification with Latvia, amongst the intelligentsia at least – stems largely from the Polish community’s traumatic experience of the Soviet occupation of Latvia (1940-1941, 1944-1990). Although there was a clear programme of Russification, involving massive immigration from the other Soviet republics and linguistic policies that placed greater importance on learning Russian than Latvian, the native tongue did remain an official language of the republic, and schooling in Latvian (with compulsory Russian lessons) was available throughout the country, as was media. This was not the case for the Poles: no Polish schools, organisations and publications were permitted to exist in Soviet Latvia. Although no concrete figures are available from the time, it seems that most Poles in Latvia – unlike the generally pro-Soviet Lithuanian Poles – were supportive of the restoration of Latvia’s independence. Poles played their part in the struggle for freedom – Riga-born Pole Ita Kozakeviča (Polish – Ita Kozakiewicz) was one of the most passionate advocates for an independent Latvia and became the representative for human rights of the Latvian People’s Front (the most prominent pro-independence movement); and Polish-speaker Jānis Jurkāns, who has said in an interview “I often wonder if I’m a Latvian of Polish origin or a well-integrated Pole”, served as the first foreign minister of the restored Latvian state. A Polish-language school opened in Riga within a year and the Union of Latvian Poles restarted its activities (although now as a primarily cultural rather than political body). Poles were also mostly spared the more traumatic aspects of the transition to independence- as most Poles could trace their roots back to the pre-war republic, they received Latvian citizenship automatically without having to pass a language test, unlike the vast majority of resident Russians, Ukrainians and Belarusians. But the years of occupation – times when, as one interviewee put it to me: “the Polish language was alive only in the family and in the church” – had dispersed and diminished the community. Although the proportion of Poles in the overall population has remained remarkably stable over the last 80 years – never rising above 3% or dipping below 2% (during the same period, the proportion of Russians, Ukrainians and Belarusians more than tripled), the destruction of the community’s infrastructure and intense Russification meant that many had become Poles for statistical purposes only. The long-standing propensity of Poles in Latvia to marry outside of their ethnic group further sped up the process of assimilation – in 1939 52% of married Poles had a spouse from another ethnic group; over the period 1990-2007 it was 89%. Nadīne is a 24-year-old Latvian with Polish heritage, but she doesn’t speak Polish and says she has no more interest in Poland than in any other country. Both her maternal grandparents were Poles from what is now Belarus who were forcibly moved to Latvia by German forces during World War II. After the war, they settled in Jelgava, a city in southern Latvia without a significant Polish minority, and brought up their children to speak Latvian, the language of their friends and neighbours, rather than Polish. But because of the way Latvia gather statistics about its ethnic minorities, Nadīne’s mother is considered a Pole (albeit one with Latvian citizenship), despite not being able to speak the language and having no particular interest in or attachment to Poland. Although the 2.5% clearly contains a lot of these kind of Poles “in name only”, there are also many who do identify strongly as Poles, especially in Daugavpils, where officially 14% are of Polish ethnicity – rising to over a third in some nearby villages. I meet Kristine Kunicka in Poļu Nams (the Polish House) in Daugavpils, an elegant magenta building first purchased by the Polish community in 1930, nationalised during the Soviet period, then restored as a Polish cultural centre in 1997. Kunicka is an exemplar of multicultural Daugavpils, married to a Russian and the daughter of a Latvian father and a Polish mother; but she is active in the region’s Polish community, studied in Bydgoszcz and sees Polish culture as attractive. Kunicka agrees that the Soviet period had a terrible effect on the Polish minority in Latvia, and feels that the Polish minority was seen as a potential threat by the Soviet authorities; while Poles weren’t forced to stop speaking the language, “teachers, headmasters came to them and said ‘please do not speak Polish to your children at home, because it is very dangerous and it doesn’t help them to learn”. She observes, though, that almost all Latvian Poles do still pray in Polish – “it’s the language of religion – like Latin”. The Poles of Latgale speak a language that diverges considerably from modern standard Polish – in some rural areas, the language that “Poles” speak may actually be closer to Belarusian. In Latgale, long cut off from Polish culture and media, anachronistic pronunciations have been preserved; here, the Polish letter “ł”, roughly equivalent to the English “w” sound in modern standard Polish, is pronounced “l” – historically the “educated” pronunciation in Poland as well, but almost totally abandoned by the mid-20th century. It’s also differentiated by a large number of Russian loan words, and occasional Latvian influence on syntax. But the insular, even secretive language of the Soviet period is increasingly being challenged by standard Polish, via the four Polish-language schools that have opened since the restoration of Latvian independence (one in Riga and three in Latgale), which teach Polish as it is spoken in Poland. Kunicka, who has written her PhD on this academically neglected dialect, observes that a “new peripheral Polish” is developing, spoken mostly by young people whose first language may be Russian or Latvian; its base is modern Polish Polish, but augmented with dialect words learnt from grandparents or other older community members. It is likely to lack fluency and depth, and will be heavier on academic concepts than slang or everyday objects; Kunicka gives as an example a student who may be able to talk about EU policy in Polish, but may not know the word for a spoon. Before leaving Daugavpils, I visit the city’s Polish school, opened in 1991 and named after the interwar leader of Poland, Józef Piłsudski. Headteacher Halina Smulko explains that the school receives funding from both the Latvian and Polish governments, but as students grow older increasing numbers of subjects are taught in Latvian rather than Polish. She also mentions that some students don’t speak Polish when they start school. But regardless of what language they learn at school, any young Polish-speakers in Daugavpils effectively have to be trilingual: Latvian for studies and to communicate with state institutions; Russian to talk to the majority of their neighbours. Indeed, while the wall displays I see as I walk through the school are in both Polish and Latvian, the students I pass in the corridors are speaking Russian. The fact that a school in Latvia can be named after Piłsudski, viewed by many as an autocrat who dreamed of restoring Poland to its pre-partition borders, would seem to be the ultimate proof that Poland no longer scares anyone in this country. This would not be true of Lithuania, where relations with the – much larger, and still overwhelmingly Polish-speaking – Polish minority are complicated by disputes over languages used on street signs and passports, and bitter memories of the interwar period, when Vilnius (Wilno) was part of Poland. Comparing the situation in Lithuania to that in Daugavpils, Smulko tells me: “the government in Lithuania is much tougher with Poles. If our government sees that we are working… they help us – or at least they do nothing to hinder us”. This seems to be the case. But it’s not clear whether tolerance and support alone will be enough to undo the damage done over the fifty years of the Soviet occupation, will be enough to stop Latvia’s Poles from becoming simply Latvians or Russians with unusual heritage.